Brian Herman, M.D. received his B.S. degree in Biology from Duke University in Durham, North Carolina, and received his M.D. degree from the University of Chicago Pritzker School of Medicine. He completed his residency in diagnostic radiology at the University of Chicago Hospitals, where he served as chief resident. He completed a fellowship in Neuroradiology at the University of Chicago Hospitals. 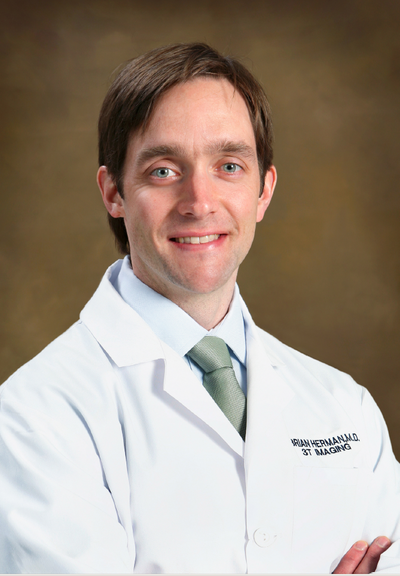 Dr. Herman is board certified by the American Board of Radiology. Neurographics, Volume 4, Issue 1. Mentor: Ed Michals, M.D. Examining the role of oxidant injury in cardiac arrest—Department of Emergency Medicine. Mentor: Terry Vanden Hoek, M.D. Establishing the Molecular Diagnostic Pathology Laboratory and evaluating and implementing polymerase chain reaction (PCR)-based diagnostic protocols to detect human immunodeficiency virus, hepatitis C virus, Mycobacteria species and hematologic malignancies characterized by chromosomal rearrangements. Mentor: John Nawrocki, Ph.D.